Re: BlackRock Renaissance ZT 4200. It’s been over a year since I did my first review. So an update would be in order. That was until I heard about the amount of these rods being sold...phenomenal, is the only word to describe it. Need I say more ? I know quite a few people who have these rods now and not a bad word. Plus seen what the Renaissance can catch. would it chuck 6oz plus a decent size bait? 2019 Species Hunt...5 bearded rockling, cod, whiting, dab, flounder. 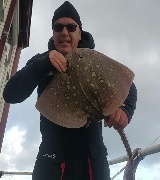 ray wrote: would it chuck 6oz plus a decent size bait? Great review Iain, looks like a nice bit of kit, I'll have a noisy tomorrow.